What are the misspellings for bend? 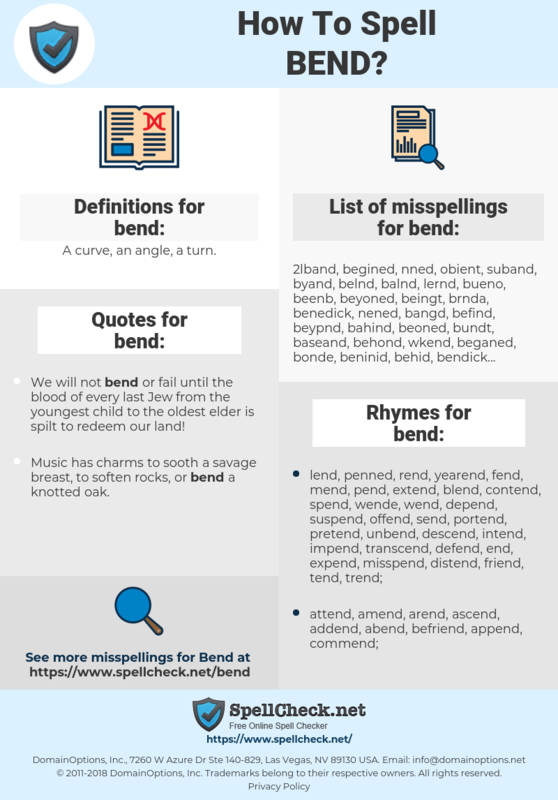 What are the common mistypes for bend? What is the definition of bend? What are the quotes for bend? 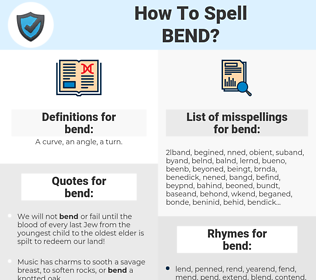 What are the rhymes for bend? What are the translations for bend? What are the common typos for bend? A curve, an angle, a turn. This graph shows how "bend" have occurred between 1800 and 2008 in a corpus of English books. 弯, 弯管, 翘曲, 拐弯处, 挠曲, 哈腰, 拳曲, 弯曲. draai, buigen, bukken, verbuigen, krommen. céder, tournant, pencher, tourner, courber, plier, fléchir, tordre, coude, virage, courbe, pli, ployer, faire ployer. abknicken, Bogen, Kurve, sich biegen, biegen, verbiegen, Biegung, abbiegen, knicken, Einbuchtung, Windung, abwinkeln, umbiegen, sich krümmen, krümmen, anwinkeln, sich wölben, verkrümmen, Biege, Kehre, Knick, Beuge, Wegbiegung, Krümmung, Knie, Knickstelle. flettere, piegarsi, chinarsi, distorcere, piegare. 曲げる, 曲がり, 曲がる, 反らせる, 折り曲げる, たわみ, いがみ, まがる, まげる, かがまる, 曲る, おりまげる, へしまげる, そらせる, 撓む, 撓る, こごまる, 撓み, こごめる, ゆがめる, たわむ, そる, ゆが, 屈まる, 皺曲, 撓める, 橈む, 反らす, 靡く, かたむける, まがり. virar, dobrar, curvar, dobra, distorcer, dobrar-se, vergar, inflectir, arquear, dobramento. someter, banda, curvatura, curva, recodo, doblar, torcer, pliegue, doblez, inclinar, agacharse, doblarse, encorvamiento, gaza, flexionar, doblegar.